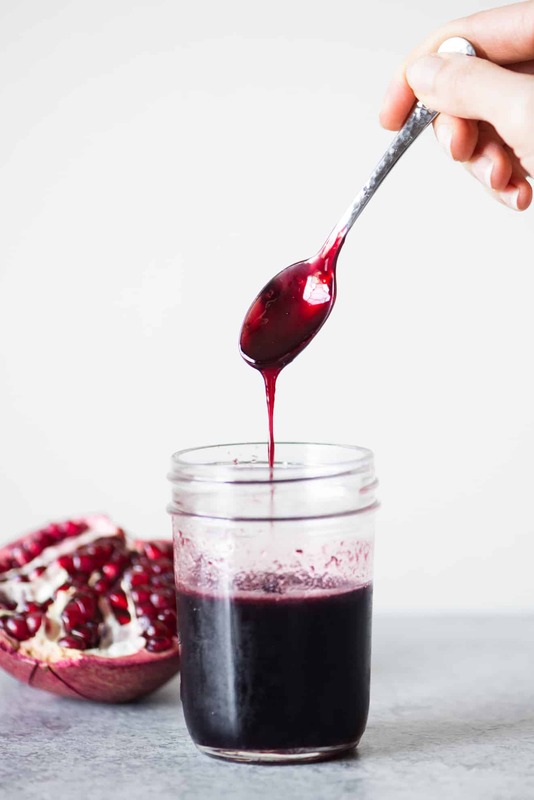 Have you ever tried pomegranate molasses? It’s tangy and bright in flavor, and it’s easy to make at home! You can use it for dressings, sauces, or roasts. You can even drizzle it on desserts! 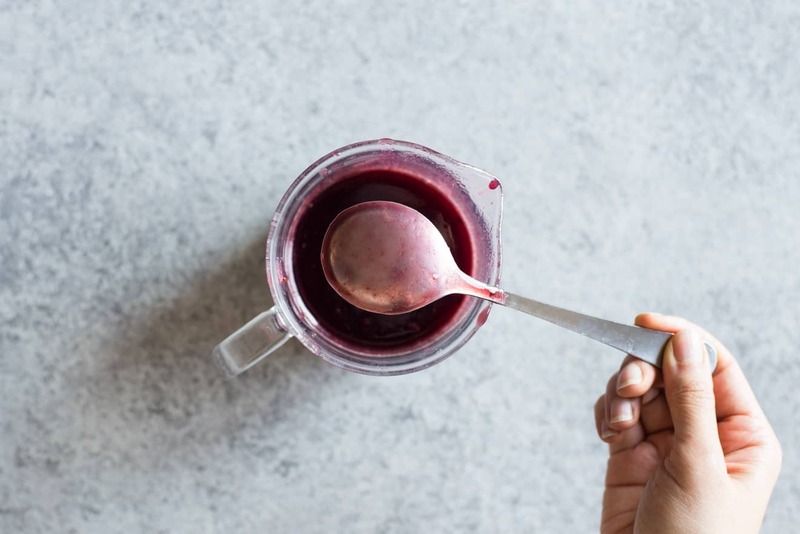 I first came across this thing called “pomegranate molasses” about 6 years ago when I flipped through the pages of Heidi Swanson’s Super Natural Every Day (one of my favorite cookbooks, by the way). It found her recipe for Pomegranate-Glazed Eggplant with Tempeh, and the photo in the cookbook looked so inviting. As I read the ingredients list, I saw pomegranate molasses and thought, “What on earth is that?” Mix pomegranate juice with molasses? That doesn’t sound right. Everything was going fine, until I bought a bad bottle of pomegranate molasses. I noticed something was wrong when I a batch of muhammara (red pepper dip) and wondered why my dip tasted bitter. Then, I tasted the molasses. Instead of a familiar sweet and tangy taste, the molasses had a bitter finish. I later learned that the bitterness could have come from the manufacturers not separating the pomegranate arils from the rind properly while making the pomegranate juice. Because of that experience, I make my own pomegranate molasses from scratch. It’s actually quite easy to make. All you do is boil down pomegranate juice, sugar and lemon juice for about 1 hour to 1 hour 15 minutes, and that’s it. You can use store-bought pomegranate juice to make the molasses. I prefer using fresh pomegranate juice because the color of the molasses will look much brighter (and better for photographs). To juice the pomegranate, we’re going to dig into those ruby globes and separate the arils. Find the crown of the pomegranate (the part that’s sticking out). (Did you know that the crown is actually the bottom of the pomegranate?) Holding the paring knife at a diagonal, start cutting underneath the crown. Make a full circle around the crown and remove it. Score the pomegranate. 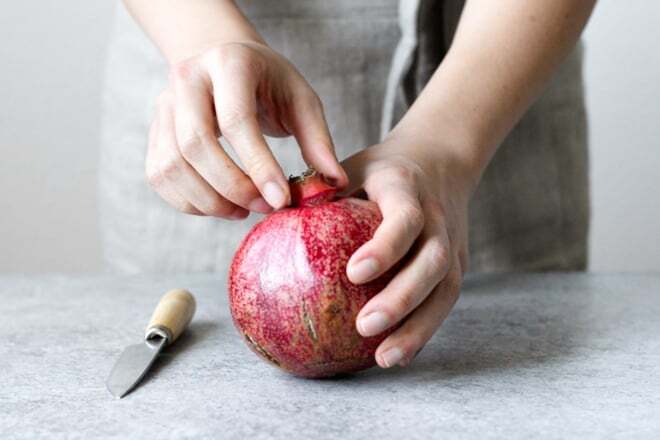 Tear the pomegranate apart into different sections. Remove the arils by prying them loose from the rind. 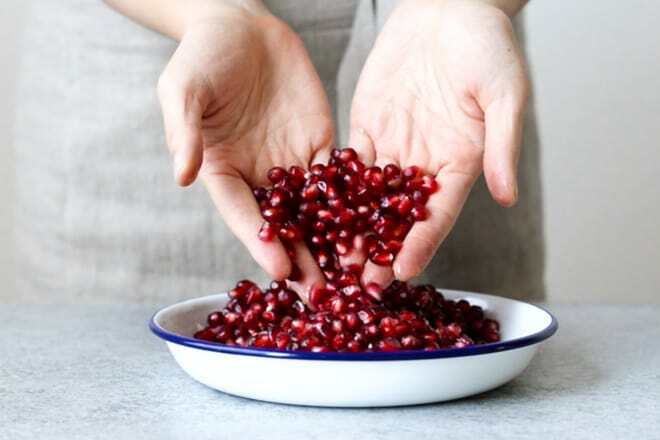 To prevent pomegranate juice from splattering everywhere (because it will), loosen the arils inside a large bowl filled with water. When you’re done, you’ll notice that most of the seeds have sunken to the bottom of the bowl and the loose membrane will float on the top. Remove any stray pieces of membrane, and drain all the water. Pour the arils into a high-speed blender or food processor, and pulse or gently blend until all the arils have been crushed. Strain the juice through a fine-mesh strainer. 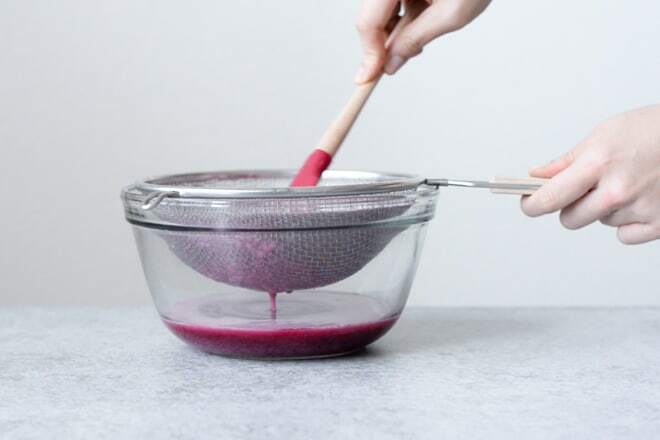 Use a spatula to press down on the purée so that you can squeeze out as much juice as possible. Right, we now have pomegranate juice. Onto making the molasses! You can overcook the molasses: When I was making the video for this, I wasn’t keeping an eye on the molasses carefully and overcooked it. The molasses turned from a beautiful magenta color to brown. Once the molasses cooled, I ended up with a very thick and stiff substance that was very difficult to remove from the jar and difficult to work with. I ended up throwing it all away. The last 10 to 15 minutes of the cooking process are the most critical, so if you can, try to pay attention then. How to tell when the molasses is done: After an hour, you’ll notice that the bubbles will start to look thicker at more viscous. That’s a good sign. You want the molasses to be able to coat the back of a spoon (see below). I also like to pour the molasses into a glass measuring jar to see how much liquids I have. Once I’ve boiled everything down to about 1 1/2 cups or so, I’ll stop. IF YOU ARE MAKING POMEGRANATE JUICE: Find the crown of the pomegranate (the part that’s sticking out). With a paring knife, dig into the part underneath the crown, and make a circular incision. You’re removing the crown and a bit of the skin underneath it so that the pomegranate is easier to peel later. Score the pomegranate. 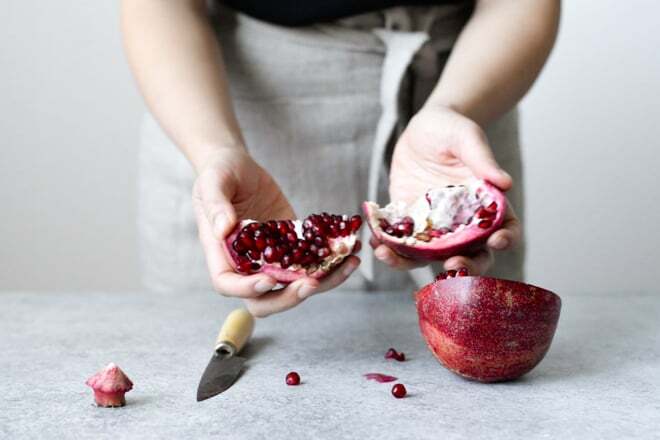 Tear the pomegranate apart into different sections. Remove the arils by prying them loose from the peel. Do this step over a medium bowl filled with water. When you’re done, you’ll notice that most of the seeds have sunken to the bottom of the bowl, and the loose membrane will float on the top. It’s okay if some of the arils are floating too. Remove any stray pieces of membrane, and drain all the water. Pour the arils into a high-speed blender or food processor, and purée until the pomegranates look like a smoothie. You may need to do this step in batches. Strain the juice through a fine-mesh strainer. 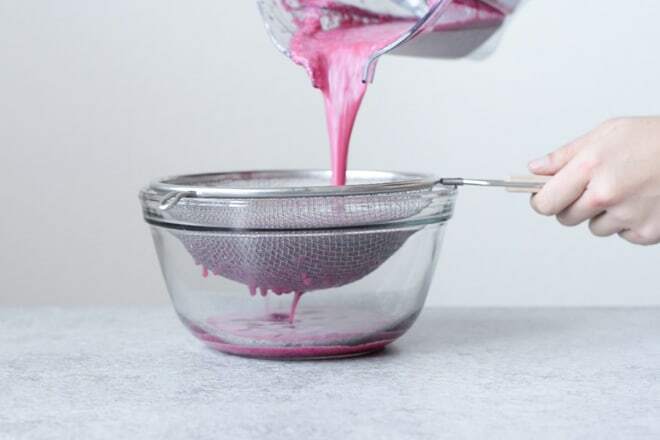 Use a spatula to press down on the purée so that you can squeeze out as much juice as possible. You should end up with 3 1/2 to 4 cups of pomegranate juice. Boil the pomegranate juice, sugar, and lemon juice in a saucepan over medium-high heat. When the juices boil, reduce the heat to a medium-low. The liquid will look a little bubbly. Let the mixture simmer for about an hour. Stir occasionally to make sure that the sugars don’t stick to the bottom of the saucepan. By the end of the hour, you’ll notice that most of the liquids have burned off. That’s exactly what we want. The mixture will still be runny, but don’t worry. The molasses thickens once it cools. Remove the saucepan from heat, and let it cool completely before pouring it into a jar. Store the molasses in the refrigerator for up to 6 months. *Note: This recipe was originally published in 2014 and has been republished to updated photos and the headnote. I’ve made my own pom molasses before but yeah..it really is SO MUCH BETTER than the one from the store. Worth it to make it yourself! It really is, and it lasts for so long, too! How long is the molasses good in the refrigerator? I’ve kept it in the fridge for a month or two and it was fine. If it hardens in the fridge, just take out what you need for your recipe and microwave it for 10 seconds or so to soften it. This looks wonderful! The color is gorgeous! You just made my day with this recipe! I have always wanted to use Pomegranate Molasses, but never wanted to buy a whole bottle! Making it myself would be much more economical (and probably much more tasty!) Thanks Lisa! I’d definitely go for the pomegranate juice if you want to save money. Fresh pomegranates do cost a bit! Let me know how it goes, Rebecca! I actually have an attachment for my KitchenAid mixer that juces the pomegranate seeds. 100 poms came out to 8 ish gallons of juice. Had to improvise a gallon jug to feed the seeds. Now on to jam and molasses. I’m fascinated by this! Over the summer I made a quinoa recipe from NY Times’ Recipes for Health that called for pomegranate molasses. I only had plain old molasses and figured it wouldn’t make a difference so I have used that everytime I make the recipe. Now I feel like I’m missing out!! Your pomegranate molasses is gorgeous and looks delish. I don’t think i’m up for the time committment involved in making it though. You may just have to start bottling yours! I have definitely done the same! I’ve cooked the same recipe with pomegranate molasses and molasses, and they definitely tasted different. I should totally bottle up some of this stuff for you. Early Christmas present? This not only looks delicious, but beautiful too! I love the color and imagine it would be a wonderful addition to many different dishes. 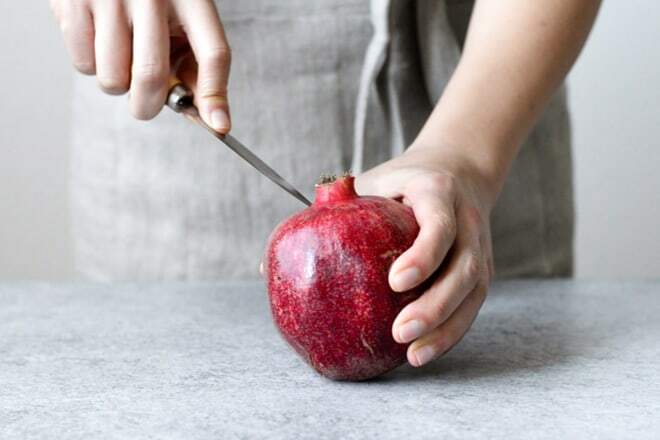 I love pomegranates but definitely don’t eat them often enough – this is inspiring! Thanks, Julia! Sometimes, I skip the pomegranates because it’s so much effort to get the arils out! I need to eat more of it myself! I was JUST thinking of posting a pomegranate molasses recipe – I’ve been obsessed with it lately! Love your step-by-step photos! Great minds think alike, right? Isn’t it amazing? It goes sooo well as a sauce to many dishes! This is utterly brilliant. I usually have to make a special trek to the Persian market for pomegranate molasses and not only will this be more convenient, I know it will be more delicious and healthier because it’s made from scratch. I’m going to try it next week in my Rosewater Pomegranate Chicken. Thanks for the fantastic recipe! Rosewater pomegranate chicken? That sounds amazing! You should definitely post a recipe for that on your blog! Sweet! Thanks for the link, Maggie! I am in awe of you. . you made your own pomegranate juice from scratch . . . and pom molasses?! WOW! love this!! Thanks, Alice! Between taking the step-by-step photos and actually making this, it definitely took me a while, but it was definitely worth it! Thanks, Karen!! It took a while to make, but it was definitely worth the time! Oh my goodness, this sounds amazing! 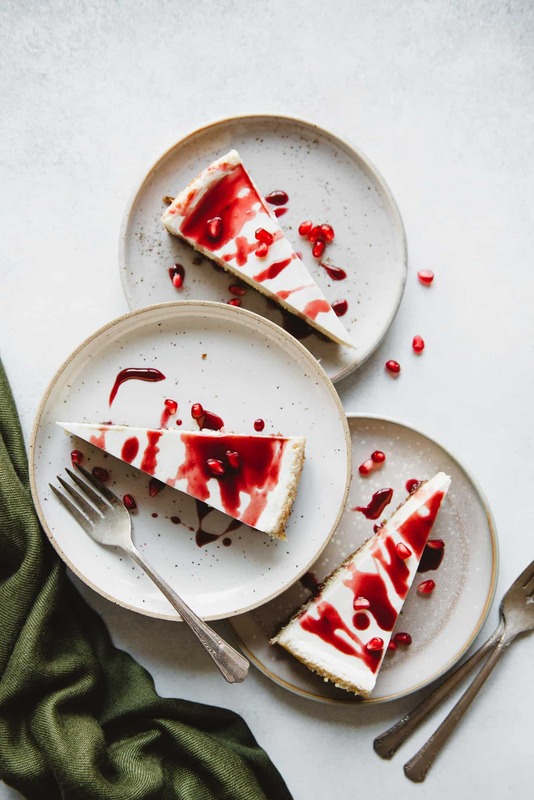 Pomegranate with molasses – or molasses with pomegranate?!!? It would make an amazing coffee stirrer! Thanks, Allie! Now that you mention it, I should definitely make another batch and bottle it as a gift for Christmas! 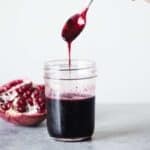 The color of this pomegranate molasses is stunning and I would love to try it with so many things! pooh can’t wait to try this! Thanks, Caralyn! Let me know how it goes! I have a big bottle of the brown molasses, I had no idea you could make your own! Thanks for the recipe! So pretty! Thanks! Let me know how it goes for your! I definitely think that the homemade version tastes soo much better. I just made caramelized brussels sprouts with them, but I don’t know if they have it in Beijing. Something worth trying might be roasting eggplant (the Asian kind) and potatoes together and adding a bit of this pomegranate molasses in it! Not even kidding you here- australia is OBSESSED with Pomegranate molasses as in- every ‘shique’ restaurant incorporates it somehow. The thing is- you can’t buy it anywhere! Promise I’ll make it when I’m back on home soil. Speaking of which- I’m kinda mad we didn’t hang out! You have to tell me what you think of the pom molasses!! Also, Yes, it’s sooo sad that we didn’t get to meet up! You need to swing by the Bay Area the next time you’re around! Saying hi from SITS! I have another project for you now – make your own date syrup!!! It’s a perfect substitute for maple syrup or honey. Recently I used it, along with pomegranate molasses on a roasted delicata squash that I finished with fresh arils. Love your brussels sprouts recipe! I run a virtual cooking community called Tasting Jerusalem that is ingredient driven – we’ve done pomegranate molasses and date syrup. Come say hi – the group is on FB, G+, PInterest as Tasting Jerusalem or at the hashtag #tastingjrslm on Twitter and Instagram. Yum—date syrup sounds delicious! I’ll definitely check out your Tasting Jerusalem community. Sounds fun! This looks too good to be true. I am going to test this out a.s.a.p. Thanks for the recipe and Happy Sunday, Lisa 🙂 Have an awesome week! Lisa help! I just finished last night and my molasses didn’t thicken up like the picture. I brought itvto a boil and left it on med/high for an hour….? Maybe with my old stove it didn’t get hot enough long enough? Help! Hi Karrie! The molasses starts to thicken once it cools off. While the molasses is still over heat, it will still be quite runny. What is the consistency of the molasses like today? Barely thicker than the juice. (I had some left over from the recipe. And how much of the molasses did you end up with when you finished the recipe? About a cup? If you have a lot of leftovers, you could pop it back into your saucepan again over medium heat and add a little bit more sugar (about 2 tablespoons or so), and cook it until the molasses is about the consistency of a thick cough syrup. Then, turn the heat off and let it cool. Does that make sense? Thanks, Heather! Let me know if you make it! Yes!! Traci, I’m so glad you tried it, and thank you for letting me know how it went! So glad it worked. Can’t wait to see this margarita! Are you going to post it on your blog? 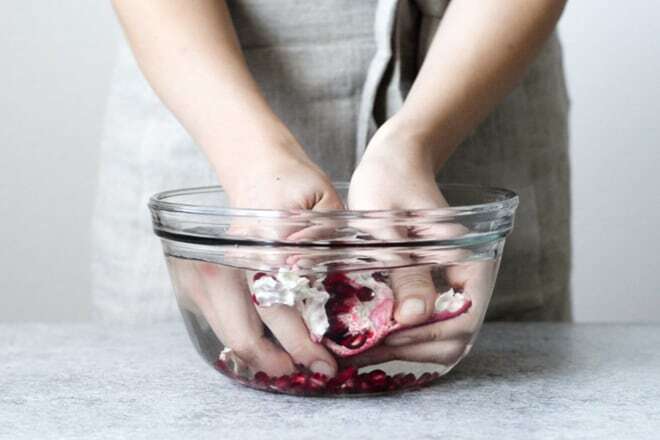 After cutting the pomegranate, try getting the arils out by holding them under the water in the bowl. Less mess. can i can the juice? i have alt of pomegranates, and not room in the freezer for all the juice. if i canned it i can keep it unrefrigerated. please help? Hi Mary, I don’t do much canning at home, so I don’t have a good answer for you. Sorry about that! DIY pom molasses is definitely the way to go. We use it often in our test kitchen and it’s always a hit. Great recipe, very easy to follow! I accidentally found your recipe after not finding the syrup locally. I googled it, after looking for it in Amazon, where they ranged from $8 to $30 for similar amounts. (around 10 oz) So I had no idea if the cheaper ones were any good or the highest ones were just way over-prices. Since I now live in small-town, middle of nowhere, and it’s still late winter, do you recommendation brands of the juice, or can one get it as frozen concentrate? Then once I make it, would you please list a few dishes, other than deserts, you’d use it on. Thanks for the recipe, photos and your replies to comments, that I found very healthful too. I want to try this recipe. I just saw Pom powder online. Do you know anything about it? Would this be a good alternative to make the boiling process shorter. ? I have not tried pom powder before, so I can’t attest to how they would work in the recipe. Sorry about that! Hi, Barbara! I don’t think it’s really necessary to get the $30 bottles. Is R.W. Knudsen one of the brands you see on Amazon? The juice is made from concentrate, but it does the job. Hope this helps! If i only wanted enough to use this in a muhammara dip would 1 pomegranate be enough? Can this be made with a refined sugar alternative? How long can you store this for for? Yes, 1 large pomegranate should be enough. Can I just use plain pomegranate juice without the lemon juice or the sugar? What would happen? Hi, Dave. You can leave out the lemon juice, but the sugar is what helps thicken the pomegranate juice so that the molasses has the syrup consistency. If you reduce pomegranate juice by itself, the liquid will get darker, but it won’t thicken. Can you substitute honey for the sugar. Have UC and can’t have sugar. Hi Suzie, I think honey will work! Made one change: cook it down without sugar and then add sugar in the last 15 min. That way I don’t have to check so often. Great tip! Thanks, Boris. I have to try that some time! I was wondering where can I find the video? If you may could you tell me the ingredients please ? How long does the molasses keep for? In the fridge or cupboard? How long should I wait until storing it? and should I be storing it or anything while I wait? Hi, Esnehar! Store this in a tight jar in the fridge. Because of the high sugar content, it should keep for up to 2 months. There doesn’t seem to be a recipe with quantities on this page, only the pics and tips. Where is the recipe? Hi, Poonam. Thank you for bringing this to my attention! I have no idea what happened. Somehow the recipe disappeared! Thankfully, I had a backup of the recipe, and I have added it back into the post. Thanks again! Can i use it to make tea??? Or do u have a different recipe for that..